Since I have enjoyed the other Robin Hood movies that I've seen, and I read some good things about this one, I decided to go ahead and pick it up when I saw the Blu-ray for $10. I'm really glad I decided to get it. The basic story is the same some of the other Robin Hood movies I've seen, though there are differences. There is no mention of Robin going off to fight in the Crusades. He decides to stand up for the people that Prince John is attempting to oppress. Maid Marian travels to Nottingham with Prince John and it seems like she is supporting him at least for a while. She clearly doesn't approve of Robin and seems to look down on the people that Prince John is treating so badly. The Sheriff of Nottingham is around, though he doesn't do as much in this version. A bigger villain is Sir Guy Gisbourne, a nobleman living in Nottingham who supports Prince John. I don't remember that character being in the other versions I've seen, but I could be remembering wrong. There is a good amount of action to the movie with Robin using his bow and arrow several times and getting into sword fights. The fight scenes are done well and look good. Some of the action looks speeding up a little bit, which makes those scenes look a little odd, but they are still very entertaining. The look of the movie makes it clear it is an older movie, but it has held up well. The costumes for Robin and his men are kind of silly, especially with the bright colors. It seems like those bright colors - especially the red that Will Scarlett wears - would make it harder for them to hide in Sherwood Forest. Some aspects of the plot are a bit serious and other things are more silly, like how Robin and the men who follow him interact with each other. They have a tendency to start laughing at stuff that really isn't that funny at times. The relationship is there between Maid Marian and Robin, though there isn't a lot of attention given to it. He seems more interested at first while she clearly looks down on him. After she spends a short amount of time with him, she changes her mind about him and it isn't long after that before she decides she is in love with him. The two of them are shown kissing once or twice and that is it. The characters are fine, though some of them are under developed. Most of Robin's men are just sort of there without anything specific being shared about them. Robin is pretty much the same as he is in other versions, though a bit more light hearted. That makes sense since the movie is more light hearted overall. The cast all does well with their parts. The picture quality is wonderful and the colors look amazing. The Blu-ray has a lot of extras on it, including a Bugs Bunny and a Daffy Duck cartoon tied to Robin Hood. I still haven't watched all of them. The extras I did watch are interesting. Overall I really enjoyed this movie and am glad that I decided to add this version to my movie collection. Thank you, I think I just found my filmfor "A" in the alphabet marathon. I have heard the name Gisbourne before, but yes, I also remember the Sheriff being the bad guy, to me most memorable for "calling of Christmas" (that was when Alan Rickman played him). Surprisingly enough, considering my sport of choice I actually little to no interest in Robin Hood. The only film version I have liked so far has been the Disney animated one. I do on the other hand though like watching archery in films (the LOTR films are good for this) so perhaps I should give more of these old Hood films a go. 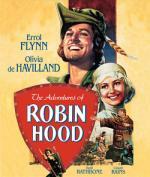 This is a wonderful movie, Errol Flynn is a great Robin. I watched it many times and always enjoy it. If you haven't seen it, you should. I suppose I better add it to my ever growing list then. I also like this movie very much. I'ts part of my Errol Flynn collection and this one is the highlight! I really enjoyed this one and am really glad I picked up the Blu-ray. I have enjoyed other Robin Hood movies, but this one is definitely one of the best. I believe this is the first Errol Flynn movie I've seen too. My mom and step dad have some westerns that he was in. I have to admit that I prefer more his "maritim" movies than his western movies (of course apart from Robin Hood). I enjoy a good swashbuckler and this is probably the greatest one of all in my humble opinion. I have the "standard" DVD of this one as I don't have a blu-ray player. I believe there are a wealth of extras on my DVD version, too. I believe this is the first Errol Flynn movie I've seen too. Check out Captain Blood, The Prince and the Pauper, Gentleman Jim and Dodge City. Also, for a serious role and probably the best performance of his career, That Forsyte Woman. He should have been nominated for this performance. I was actually already thinking about hunting up Captain Blood. I got a book like 2 weeks ago from the bargin table at the bookstore...501 Must See movies. This one was in it, and so is Captain Blood.